Most everyone agrees that the U.S. tax code is ridiculously complex. Presidential candidates from both parties have promised simplification. So why is this so difficult? This chronicle of the last major effort to revamp the tax code provides plenty of clues. Despite opposition from an army of high-priced lobbyists, The Tax Reform Act of 1986 ultimately prevailed, closing loopholes and lowering tax rates (31 years later, the tax code is riddled with complexity once again). 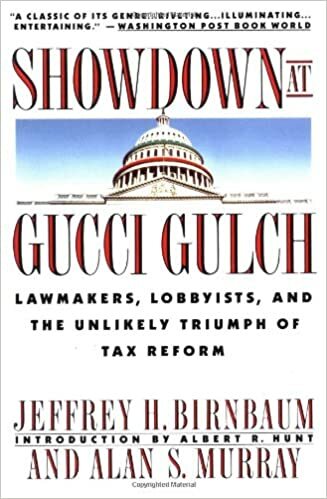 Birnbaum and Murray, both reporters for the Wall Street Journal when they wrote this book, provide a detailed account of the wheeling and dealing that made tax reform a reality back then. Showdown at Gucci Gulch is one of the rare nonfiction books that manages to build suspense even when you know how it’s going to end. Could tax reform happen again? After re-reading this book, my takeaway was: don’t hold your breath.